Newsflash to no one: It’s cold outside. Really cold outside. It doesn’t mean you have to stay in, though! You can still bundle up and babywear. 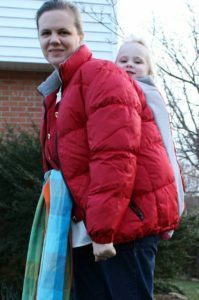 It’s best to be comfortable with your carrier before trying to bundle up with it so you have a sense of how it feels when it’s adjusted that you can replicate with the extra layers. Your carrier type can also help you dictate how you bundle up yourself and your wear-ee. Ring Slings are easy to adjust on the fly, so they can accommodate extra bulk without a lot of prep. 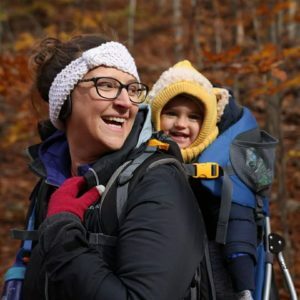 For buckle carriers that are already perfectly adjusted, you may want to go with layers that fit over both you and your kiddo so you don’t have to adjust as much. Frame carriers hold the wear-ee up and away from your body – so you won’t have the benefit of shared body heat and may want to add an extra layer. How long you’re going to be outside should dictate how much you need to bundle up. If you’re just going from the car to the school/store/house, not much bundling is needed – a hat and a blanket to throw around the carrier will be sufficient to get you in and out. If you do add layers, it’s best to shed them once inside and put them on again right before going outside again – this will make you feel warmer! If you’re going to be outside for a more prolonged period, you’ll want to layer up. For serious outdoor time, you’ll want a base layer, another layer (preferably warm fleece! ), and a weather layer – on both you and your wear-ee. It doesn’t have to be expensive to bundle up – footed fleece pajamas make a good base layer for little ones, and fleece sweaters and sweatpants are often on sale at Carters. Also, make sure all the gaps are covered – long wool socks or baby leg warmers are perfect for covering legs and arms from pants or sleeves that will ride up. And never underestimate the value of a warm hat! 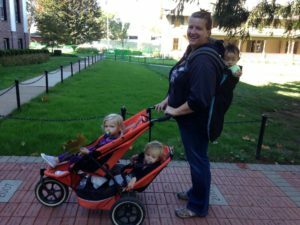 Do You Need a Babywearing Coat? 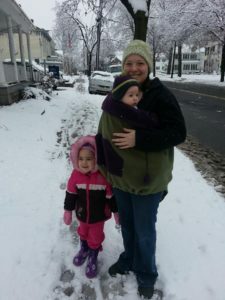 If you’re bundling up you and your little one together, a babywearing coat or fleece is a good – and easy – top layer. You can find fleece covers on Amazon and many carrier companies, including Lenny Lamb and Diva Milano, sell babywearing coats. Coats can also be DIY’d by cutting a panel in the back or front and adding fabric to accommodate baby. (We have a DIY coat in our Weeknight Lending Library if you want to come check it out. DIY No-Sew Fleece Ponchos are also an option. But, you don’t have to have a special coat to babywearing during the winter. An oversized coat or maternity coat will work well for most front carries. Bundling separately is also a perfectly fine option! 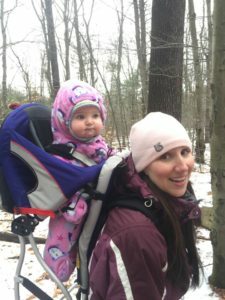 Regardless of how you bundle up, you want to keep the babywearing safety basics in mind. You always want your little one’s airway to be clear and visible – so make sure those extra layers don’t block either. You want to keep their spine in a neutral position and strive to keep their legs in the M position – with their knees higher than their bottom. Also, wearing should be comfortable for both the wearer and the wear-ee. This mostly depends on personal preference and the quality of your outdoor gear. If you’re bundled up properly, freezing temperatures are totally manageable. You want to remember that the younger the baby, the more trouble they have regulating their own body temperature so you’ll want to keep them out for shorter durations and be more vigilant to look for distress cues from them. It’s also worth noting that exposed flesh will start to freeze right around 0 degrees Fahrenheit, so if the temperature is there or near there, that’s the line where you’ll want to limit time outside or plan to stay in.